Since 1988, Lorna’s Italian Kitchen has been a favorite of San Diegans for lunch and dinner. And now, it’s the place to go for Happy Hour! Lorna’s has developed a Happy Hour menu with beer and wine selections and delicious appetizers and plates to share including smoked mozzarella sticks, fried calamari, meatball sliders, and stuffed dates. The Happy Hour menu is available Tuesday through Friday, 2 to 5 PM, at their location 3945 Governor Drive, in the University Square shopping center, next to VONS, on the corner of Governor Drive and Genesee. 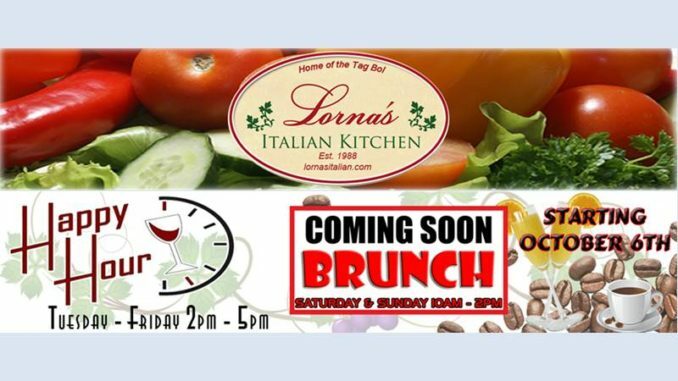 And coming soon in October, Lorna’s will also be the place to go for Saturday and Sunday brunch from 10 AM to 2 PM.